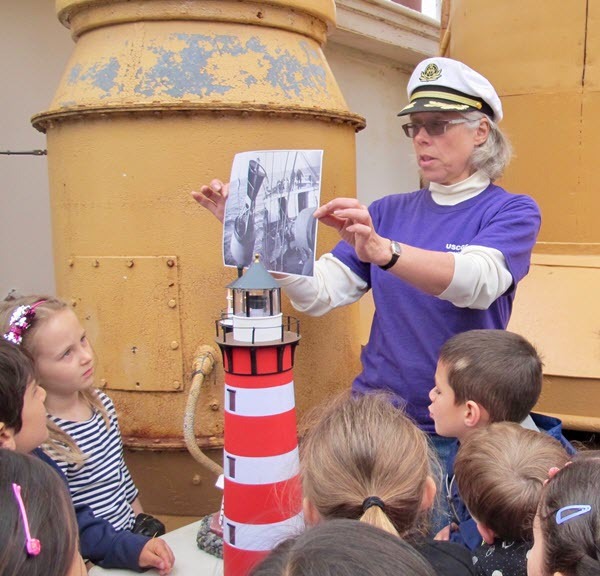 Museum director Mary Habstritt tells the children about the ship’s work as a U.S.C.G Lighthouse Tender from 1933 to 1972. It’s a safe bet that the kindergartners at Downtown Manhattan’s PS 234 know more about watercraft and waterways than the average New Yorker. Since March the school’s five kindergarten classes have been learning about water transportation of all kinds. “Manhattan is an island,” teacher Francine Cornelius explained, “so the children who live here should know about boats,” noting that they offer opportunities for math, science, reading and social studies lessons. The program, which runs through June, includes trips on the Staten Island Ferry as well as a small cross-Hudson commuter ferry, a visit to the kayaks at the Downtown Boathouse, hands-on buoyancy tests, model boat building, walks along waterfront to watch river traffic and lots and lots of reading about boats. On a damp morning in mid-May the five- and six-year-olds from Cornelius’s class clambered up the gangway to the boat deck of the steamship Lilac, a 174-foot historic ship docked at Hudson River Park Pier 25, where museum director Mary Habstritt (Captain Mary to the kids) told them about the ship’s work bringing supplies to lighthouses and maintaining navigation buoys. 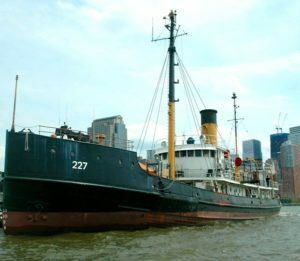 The historic steamship Lilac, where I volunteer as a museum docent, is docked at Hudson River Park Pier 25 in Lower Manhattan and is open to the public on weekends. Pointing to the swirl of black stripes on one lighthouse and the horizontal red bands on another, Habstritt explained that lighthouses are painted in different colors so they can help tell a ship where it is. “Sailors know if they see this black and white one, they must be in North Carolina,” she said, adding that at night the lights on these “tall skinny buildings” blink at different speeds to warn ships away from dangerous rocks and point to safe channels. What would happen, she asked, if a ship got lost. “It might crash into the rocks and sink,” one boy said. “Yes!” Habstritt said, and then went on to explain that Lilac was important because its job was to take care of the lighthouses and other aids to navigation that show sailors where it is safe to go. Lilac, which celebrated its 85th birthday on May 26, is the last surviving steam-propelled lighthouse tender in America and is listed on the National Register of Historic Places. During its active career from 1933 until 1972—first for the U.S. Lighthouse Service and then for the U.S. Coast Guard—it carried supplies to lighthouses and their keepers and maintained the buoys and range lights that guide ships and boats into harbors and away from rocks and reefs. It was acquired by the nonprofit Lilac Preservation Project in 2003 and has been docked at Pier 25 since 2011 while undergoing restoration. The ship is open to the public on weekends, and it frequently hosts school and summer camp groups. Close to 8,000 people visited in 2017. Lilac is open on Saturdays and Sundays from 2 p.m. to 6 p.m. from Memorial Day weekend through mid-October. A special exhibit “Innerspace Microsculptures,” a selection of photographs of Hudson River phytoplankton by Andrew Paul Leonard, will be on view through July 31 and is co-sponsored by the ship’s environmental partner, The River Project. For more information, visit lilacpreservationproject.org. This entry was posted in Lighthouse Tender Lilac, Students. Bookmark the permalink. OPBs, a.k.a. Other People’s Boats, is a blog about the vessels, people and activities that keep our waterways vibrant. 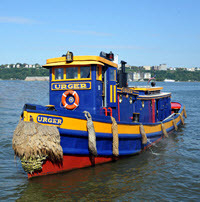 It will include posts about historic ships, like the 1901-built tugboat Urger (above), kayaks, sailboats, fishing boats, ships and the people who operate them, plus on-the-water events you won’t want to miss. Stay tuned.